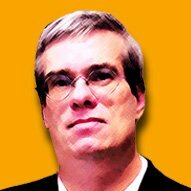 Theta is not beyond reach, but why do it? 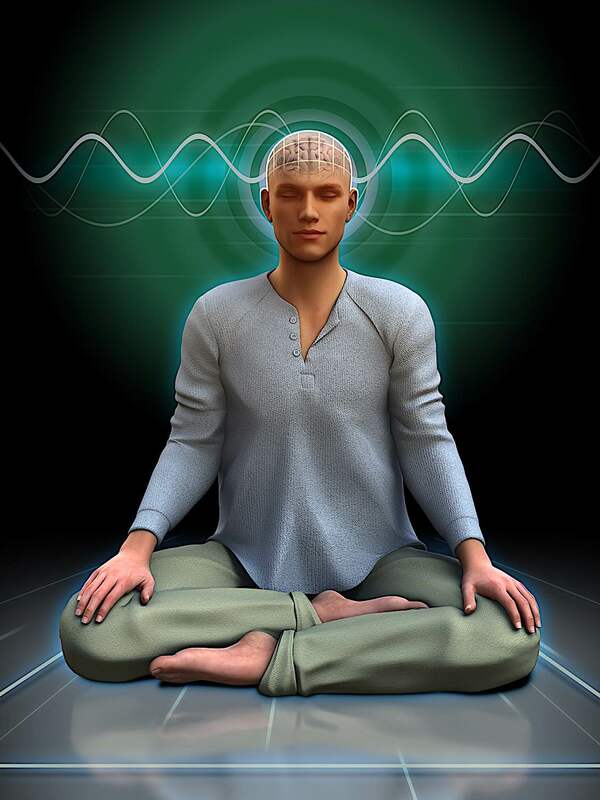 Theta brainwaves in meditation have significant health and cognitive benefits — according to numerous studies. Theta is associated with “ideas without censorship” or “ideation” mind mode . It is also one of the secrets to a healthy mind and body. “During meditation, theta waves were most abundant in the frontal and middle parts of the brain” reports NTNU in Science Daily. Jim Lagopoulos, of Sydney University (Australia) comments: “Given the popularity and effectiveness of meditation as a means of alleviating stress and maintaining good health, there is a pressing need for a rigorous investigation of how it affects brain function.” He is one of the principles of a joint study between his university and researchers from the Norwegian University of Science and Technology (NTNU) on changes in electrical brain activity during nondirective meditation. 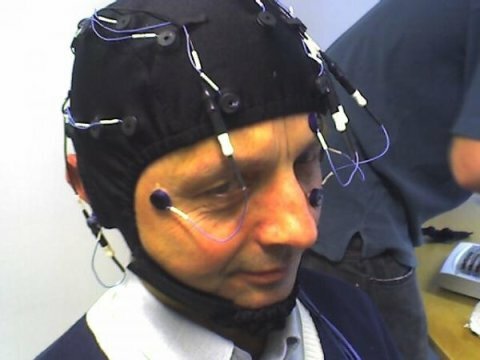 In a breakthrough study by NTNU, scientists used a special “cap” that measured brainwaves during meditation. Sound: binaural sounds, drumming, rattling, singing. Repetitive tasks (for example, the Zen practices of sweeping, archery, martial arts). Each of these breaks down into more detailed methods, for example, mindfulness of perception, mindfulness of breath, and mindfulness of body. Under guided meditation, there are innumerable methods. Shamanistic-style drumming and rattling are just two of many approaches to sonic methods. Analytical meditation, logic, debate, and other forms of spiritual meditation are not necessarily ideal for generating Theta. They tend to push the mind into either Beta or Alpha. They have their place — as a method of developing wisdom — but they are not the focus of these studies. A “non-ordinary state” of mind — Theta — is the goal of people pursuing creative insight, health benefits or cognitive development. One healthy mechanism for “non-ordinary state” is built into our daily lives: dreaming and day-dreaming are altered states, and vital to our health. Advanced practitioners often engage in lucid dreaming. 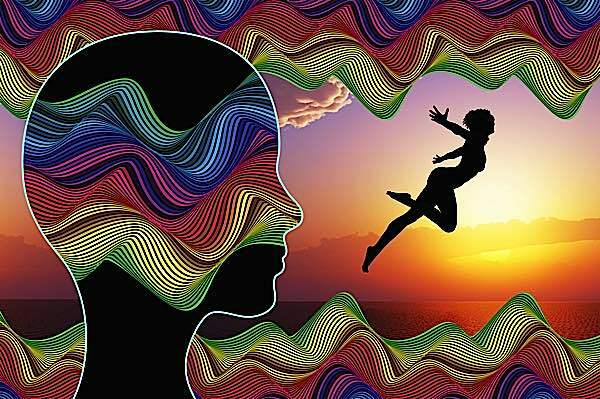 Aside from natural and lucid dreaming, the main “learned” methods are various forms of “non-directed” meditation, which has the added benefits of insight, reflection and blissful mind. 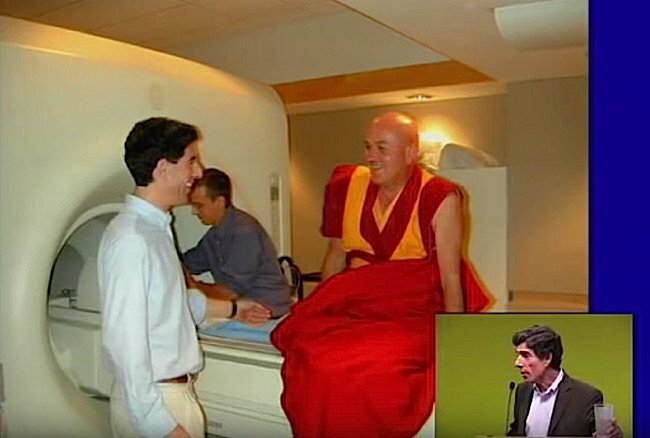 Matthieu Ricard is still smiling after a gruelling, claustrophobic meditation session in an MRI. 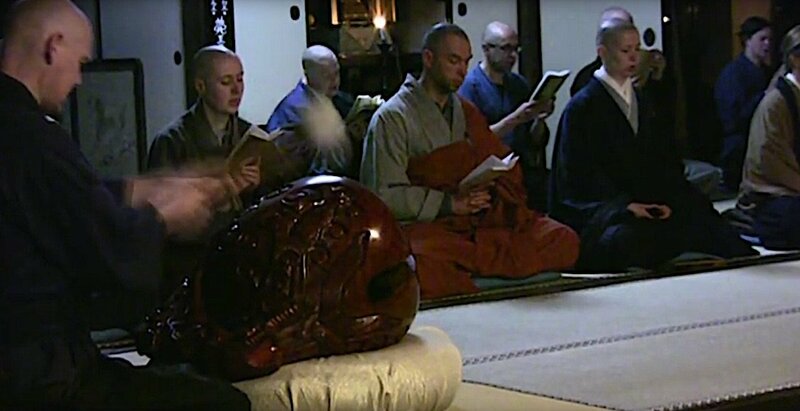 He is a monk participant in an extensive study on compassion’s effect on happiness and health. In this feature, we explore these five mains styles of meditation — mindfulness, guided, mantra, sound, and repetitive tasks — all proven methods to achieve altered states of consciousness, without drugs, fasting or other unhealthy tricks. They are so diverse; one is bound to appeal to you. All of the five styles generate a form of “non directed mind.” In Buddhism, this is somewhat akin to the concept of Emptiness. Emptiness does not mean nothingness or non-existence. It means empty of ego, empty of direction, empty of stress — it is also a sense of “fullness” and unity with everything else. When you are mindful, your mind expands. Distant sounds become clear. Your mind expands beyond logical Beta thought. Expansive Theta mind becomes One with everything, no longer censored or constrained by logical mind and ego. Genuine cognitive and health — and Dharma — benefits are associated with attaining Theta brainwaves. 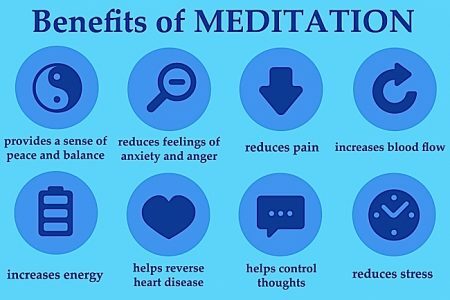 The known benefits of meditation. 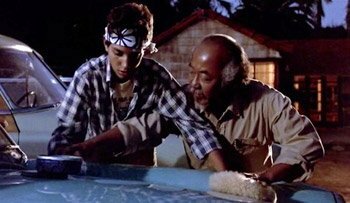 Mr Myagi teaches the “Karate Kid” the “Wax on, Wax off” method. Repetitive tasks — washing the car, painting the fence, sweeping the floor, raking the leaves — can induce Theta. All of these are non-directed meditations can induce Theta. The stress of daily life induces alert, survival BETA. 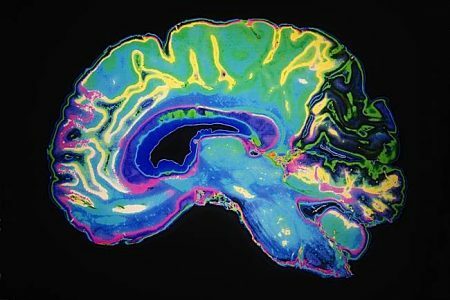 “Ordinary mind” — in brainwaves classified as BETA, the stress-inducing frequency of our survival “awake” mind — evolved to help keep us alive. It motivates us to act, to work, to gather food, to cope with danger. The ordinary, awake mind induces wakeful stress to help us survive — an evolved stimulation that has its evolutionary roots in our hunter-gatherer beginnings. Ordinary mind also evolved ALPHA brainwaves — the relaxed and reflective mind — once we evolved enough to seek refuge in caves, to build castle walls, or houses with locks. Only at night, in the safety of our caves — our homes — did the mind release the high-alert ordinary mind, and allow a little stress-reducing downtime, in the form of THETA and DELTA brainwaves: THETA during relaxing escapes such as napping, story-telling and song (today, movie watching and stereo) and DELTA during dreaming and sleep — both achieved, mostly, in the relative serenity that comes from a rampart (today, an alarm system.) This is why it is often difficult, for instance, to achieve relaxing THETA or DELTA as a stressed-out patient in the hospital. Mindless thriller entertainment can induce a form of Theta. It’s escapism that invites “suspended disbelief” — and in some cases, a drowsy state of mind akin to Theta. 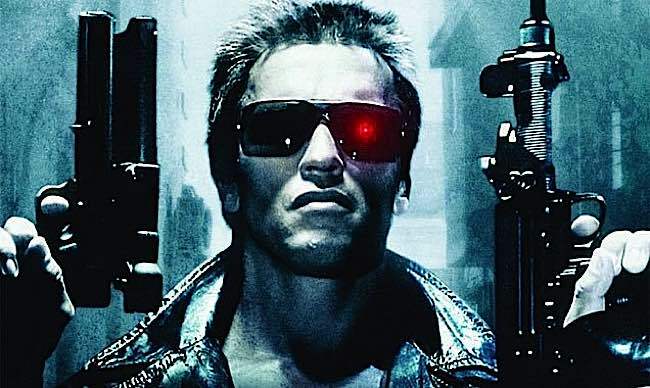 Ever wonder why silly action-movies and mindless thrillers and comic-book adaption movies are so popular? It’s not that they are “relaxing” in tone and manner; it’s simply because they are a form of escapism. It’s so far removed from our stressful BETA lives, that it genuinely induces an ALPHA state in many of us — relaxed mind— probably similar to the feeling the ancient Greeks must have experienced when they listened to the exciting tales of the gods and heroes. On the other hand, a gritty, artsy, true-to-life biography or war history movie might inspire the opposite — triggering BETA — simply because it resonates with our day-to-day stress-mode. 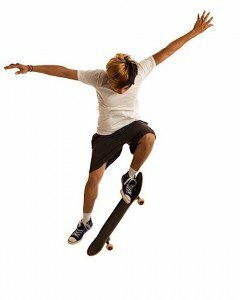 In fact, going one step further, an over-the-top adventure or comedy movie or novel, while it usually induces an ALPHA state, can trigger THETA. (Yes, that’s you, the movie-goer who drowses slightly during the action movie.) In meditation, the goal is usually either a deep ALPHA (highly relaxed and reflective mind, for instance in Samatha meditation) or light THETA (visualization meditation.) So, although an escapist myth, movie or novel will not replace meditation, it’s certainly “good for you.” Just avoid the too-real, too-historical, too frightening stress-inducing stories unless you’re ready to jump back up to stressful BETA. 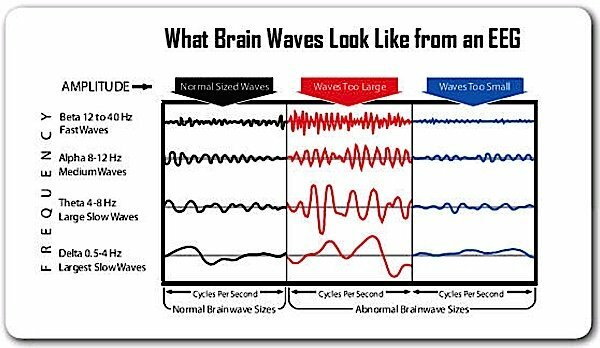 When an EEG is taken of a person focused on drumming at four beats per second, the brainwave will inevitably go to Theta or least Alpha. An experienced Buddhist monk or meditator during silent mindfulness meditation would likewise achieve Theta brain waves in the low cycles. 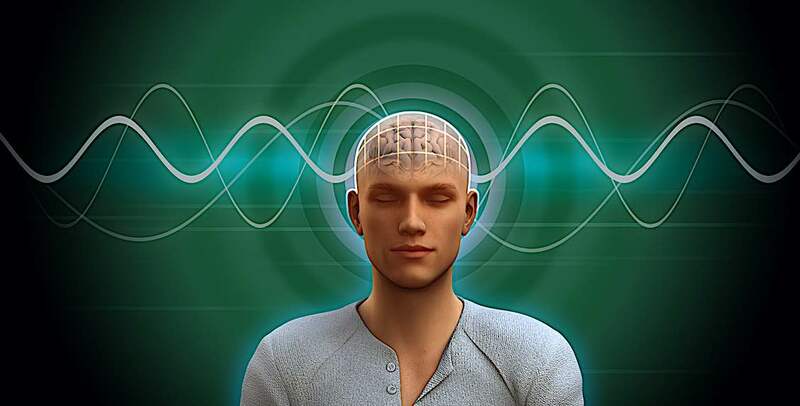 Theta brainwaves occur between 4 – 7 Hz or 4 – 7 cycles per second and is associated with meditative serenity, daydreaming, fantasy, imagination, ideas, inspiration. Deep Theta is often achieved by very expert meditators, and could almost be described as lucid dreaming. For the rest of us, mindfulness tends to result only in a light Alpha wave. A sense of safety and security helps coax the BETA brain to release its “red alert” state. Laughter, song, silly movies, good food, friends — all these help us feel safe and secure and encourages a wholesome ALPHA relaxed mind. Ultimately, for real health benefits, we hope to achieve a deep ALPHA or a light THETA. Meditation, in a safe environment, is certainly one of the surest ways to induce stress-relieving brainwaves. With mindfulness, you might also accidentally slip into DELTA (sleep mode) but if you’re doing formal Zazen retreat watch out! — whack on the shoulder from the teacher might wake you back up. 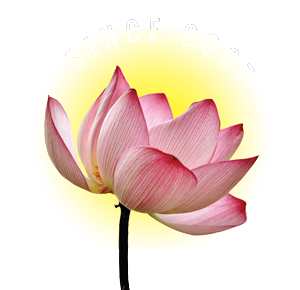 From a meditational point of view — and certainly from a Buddhist perspective — ASC is the mechanism that makes meditation valid as both a stress-reliever and a doorway to insight. Altered States — specifically THETA brainwaves — is not the goal, it is only the mechanism. The goal of meditation can vary: health, stress-relief, insight (in Buddhism, “wisdom”), relief from depression, and, specific to Vajrayana and Buddhism: achieving “bliss and wisdom in union.” But the mechanism for achieving most of these is a state of THETA. In Vajrayana, it is sometimes said that altered state is the horse, and insight is the destination. In other traditions, such as shamanism, the drum might replace the horse — the drum being the audible mechanism helping achieve ASC — and “meeting” a spirit guide might be the goal. In real yoga — not the one-hour gym class — the mechanism and goals are similar. Mantras and meditation can be done almost anywhere. Mingyur Rinpoche coaches us to at least do a few seconds or minutes of meditation at a time, instead of waiting for that long session that never comes. In several studies, MRI scans are used to visually measure the significant changes mindfulness meditation can achieve. Importantly, formal meditative practice is specifically designed to quickly induce THETA — or in some cases light DELTA. 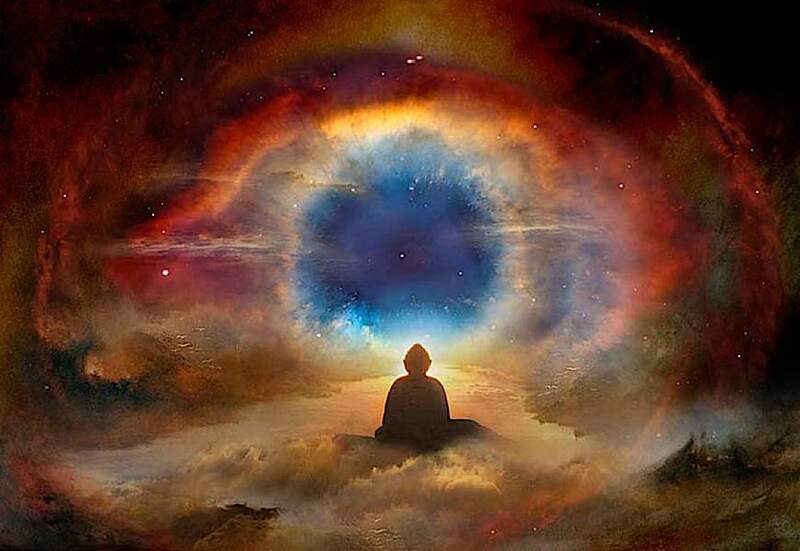 Lighter DELTA could be thought of as daydream mode, but in meditation is associated with visualization practice and LUCID dreaming. While THETA is ideal for stress-reducing and idea/insight, DELTA has a more specialized meditative mission: deeply altered states of consciousness that allow us to see beyond conventional reality biased by conditioning. Buddha taught many methods for loosening the grip of conditioning on our fragile psyches. We grew up conditioned by pain and suffering — from our wailing emergence from the safety of our mother’s womb to the often-traumatic experiences that follow. We also develop attachments to those things we enjoy. 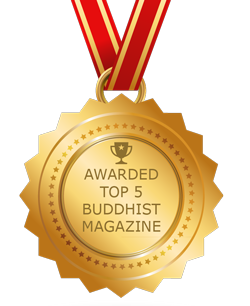 The Four Noble Truths and the Eightfold Path provide the initial teachings on overcoming this conditioning that keeps us in a “suffering” state of mind. In the dream world, we can fly; when awake gravity takes hold. When we visualize the merit field of Enlightened Beings, we see a Pure Land as it could be if we removed attachments, conditioning and clinging; when awake, we see endless pain and suffering. Even pragmatically, when our therapist coaches us with a guided meditation, to help us overcome some specific trauma, we are experiencing Theta. Although we have more extensive “how-tos” on these various practices, here is a quick “cheat sheet” to inducing Theta through the Five Styles of Altered States Meditation. Guru Rinpoche, the great Sage of Tibet, stressed the importance of alone time. 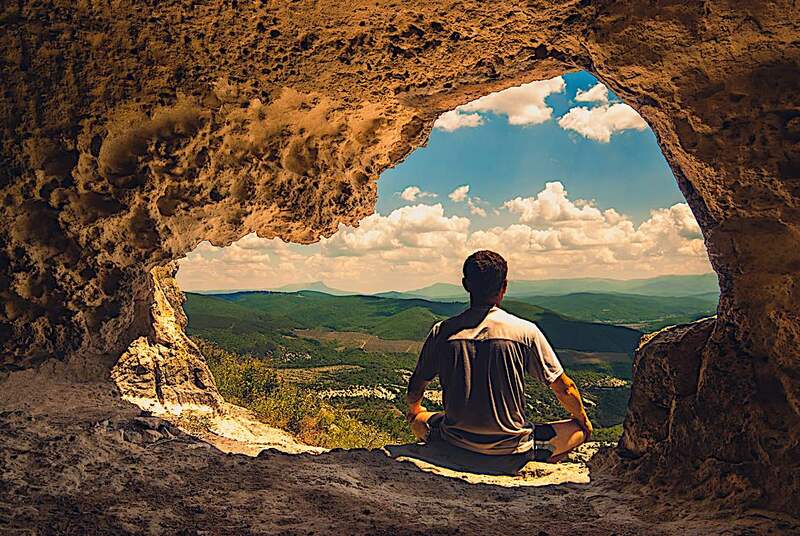 Even if you can’t get away to a handy “meditation cave” a close door and a turned-off cell phone makes sense. So, by way of instruction, sit, stand or walk (in all three cases in a situation where your mind doesn’t have to intervene) and then try to simply observe. Not only do you “observe” what is happening around you — the ticking of the clock, the chirping of the bird — but without engaging with it. The great teachers would say, “simply be.” Be mindful. Be observant. Be there but not participating. Attempt this for at least 1o minutes. Don’t try to “empty” the mind of thoughts — some meditators try to force this — but simply, instead, observe them. Even if they are stressful, nasty, hateful thoughts. No judgment. Simply observe. Sit or stand in a way that is non-involving (comfortable). Adopt an upright but comfortable posture. 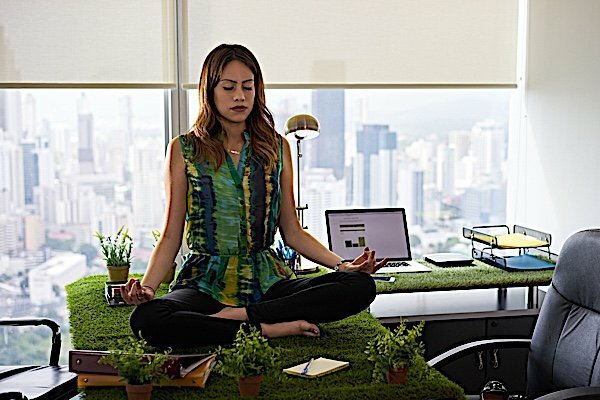 Meditation in the office can make you more productive. Mindfulness during a meeting can result in fewer mistakes. Breathing meditation can calm the stress that inhibits innovation and enthusiasm. Initially, count your breaths and relax. Correct your posture, but remain comfortable. Half close or fully close your eyes. Watch your breath. Feel it. Observe it. Do not participate. Begin to notice, without participating, what is going on around you: sounds, feelings, heat, cold, dampness, itchy skin. Observe your mind and its thoughts, but do not participate. Simply let it be. Watch. Expand your observation. Try to listen beyond your immediate space. Continue observing, without participating as long as you can. If you start participating or correcting random thoughts that bother you. Simply cease and observe. Do not correct. You don’t have to involve spiritual visualization to achieve some benefits from this method, but for a Buddhist, Vajrayana visualized meditation is the pinnacle of technique. 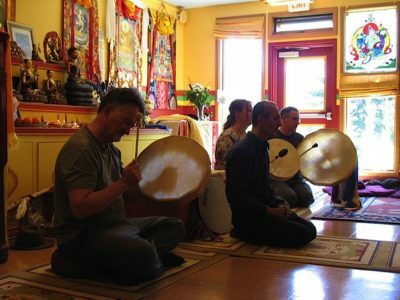 Any collection of sounds can become a mantra, but in Buddhist meditation, many are profound and meaningful — expressing in sound and rhythm deep truths. Some are open to everyone; others are restricted practices because they require instruction. The goal of mantra is a little more specific. Although the “mind” is still observer and detached from calculated thought, the repetitive or hypnotic element is a repeated mantra. The sound is repeated hundreds of times. Often, this is combined with visualization — even something simple, such as healing blue light filling your body. Other times, it’s just the sound and a mindful, watching mind. Mantras in serious practice are usually intoned at a very low, rhythmic pitch, like the beat of a drum. They go beyond the role of rhythm and sound, however. 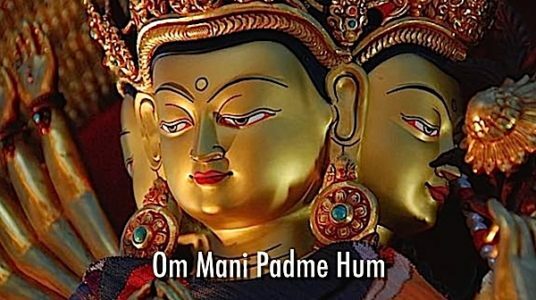 Mantra contains within it a “stated intention.” If you chant the Medicine Buddha mantra, you are likely planting the seed of healing in the mind. It is said you can’t implant a hypnotic suggestion that the recipient doesn’t agree with. It’s still your mind and will. But mantra reinforces the positive intention to heal, or live a long life, or receive protective energies. Aside from mantras, which include the added purpose of implanting an intention, other repetitive sounds also induce Theta, notably drums, rattles and chants. Reduces blood pressure, anxiety and stress: a 2014 study published in the Journal of Cardiovascular Medicine. Improves cognitive function: 2014 study in the Journal of Huntington’s Disease. 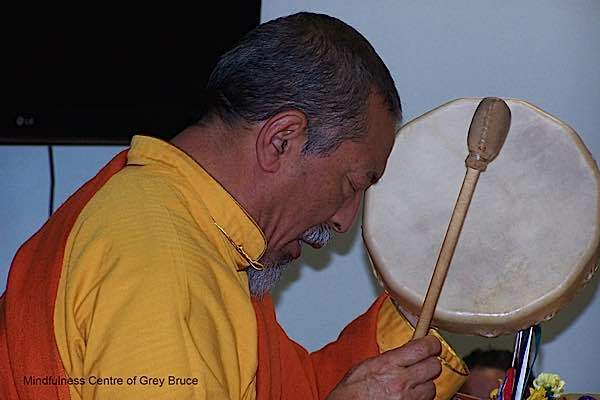 Theodore Tsaousidis leading a drumming session at a Buddhist temple. Drumming, or any form of percussion provides a strong focus on mindfulness. It’s as simple as taking your favourite meditation technique and adding the drum as the focal point, rather than the breath. You can either drum for yourself (which has extra benefits: the live sound of a drum is very moving), or use a drumming MP3 or recording. 1. Sit and get comfortable. Alternately, some people prefer to stand or even dance while drumming. 2. Using any drum, beat a regular, monotonous beat. You can beat quickly, which tends to induce a Theta response (helpful for visualization practices in Vajrayana, for example), or slowly. A heart beat, ba-bump, ba-bump, ba-bump has also been identified as therapeutic. 3. Drum for at least 15 minutes. I find 30 better. Simply focus on the beat (rather than your breath). Become the sound. As always, with mindfulness, if the mind drifts, just refocus gently back on the beat. If images appear, just observe. Be the listener (observer). There is serenity in the broom, the mop or the clothesline. Many people, when they are furious — say, a fight with a significant other — will take refuge in cleaning the house. The repetitive tasks, such as brooming, mopping, vacuuming can be highly therapeutic. 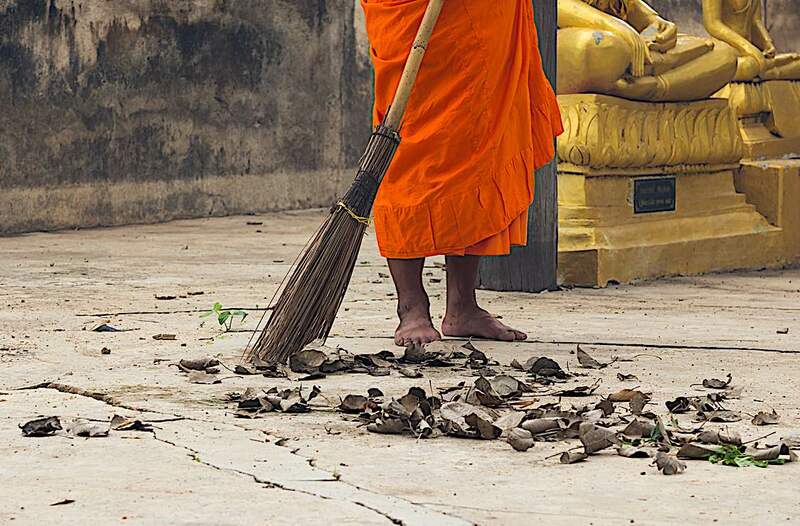 Sweeping the temple is often assigned to monks. It is not considered a chore. It is a practice, a high form of meditation, dedication and good merit. More formally, in Zen traditions, repetitive tasks are often assigned, such as “sweeping the temple” or weeding the garden. However, instead of simply saying “Go clean the floor” the teacher will actually show a specific hand motion to be used, a direction to sweep and a speed to employ. The mindless repetition is the meditation. 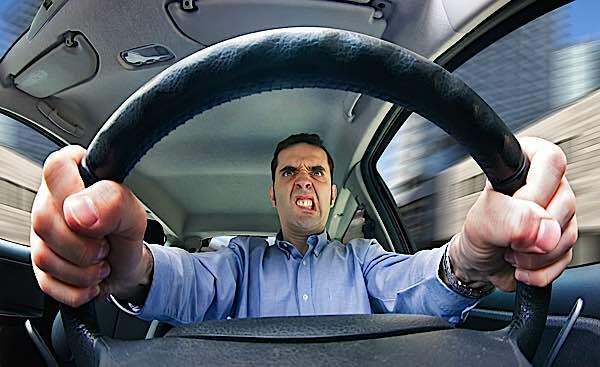 It unleashes the Theta mind, in the same way, a monotonous curve-free highway does for a drowsy driver. To make this work, either receive instruction, or create your own “ritualized” repetitive task. Clean the floor, yes, but do it with a precise, memorized pattern and speed. Any repetitive task can be therapeutic, but to rise to the standard of meditation and Theta requires an element of ritualization. “Altered States of Consciousness” Psychology Today, Christa Smith Psy.D. “Brainwaves and meditation” Science Dailey, NTNU research source.